You’ve probably heard of Roald Dahl. 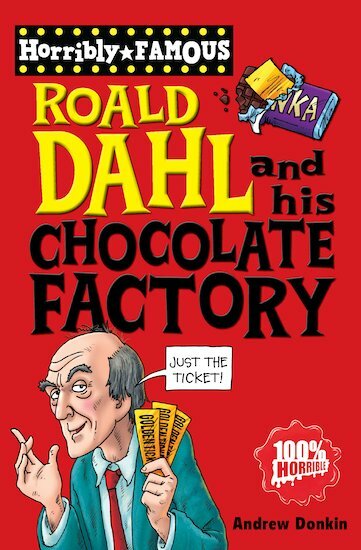 He’s dead famous for: writing loads of brilliant books for children, telling terrifying tales of the unexpected, and creating a fantastic chocolate factory. But did you know that Roald was a fighter pilot and a spy in the Second World War, loved playing outrageous practical jokes, and nearly lost his nose… twice? Yes – even though he’s dead, Roald Dahl’s still full of surprises! It is good ,funny and get’s me craving for chocolate. Did you know Roald Dahl was in the Royal Air force?A must-read. This book explains whatever is hidden about Roal Dahl… For more, I think you’ll MUST read D is for Dahl. Its amazing. It even tells you how R.D got ideas to write specific books! Really cool! This is awesome. :) * * * *! Incredible idea developed into an incredible book!